"War Department, Washington, April 20, 1865. $100,000 Reward! 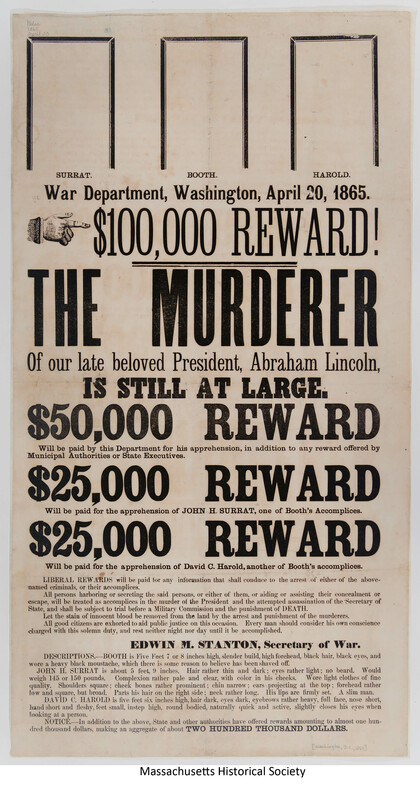 The Murderer of Our Late Beloved President, Abraham Lincoln, Is Still at Large"
Large broadside with a proclamation (signed in type) by Edwain M. Stanton, Secretary of War, describing the rewards offered for the capture of the assassins. The broadside also includes a description of the fugitives and notes that Booth might have shaved off his mustache.